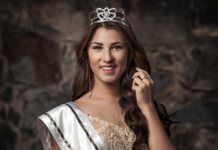 Miss Ecuador 2016 Connie Jiménez is all for breaking stereotypes. This 21-year-old Ventanas native works as an Agribusiness Engineer, an industry dominated by men. She also works to help families affected by the earthquake in her country last year. If fortunate to be crowned the next Miss Universe, she wants to work on projects that teach people how to keep producing food in a eco-friendly way. Get to know more about her. I faced a very difficult challenge becoming an Agribusiness Engineer; wearing boots with steel toes, feeding pigs, cows, fishes, using “Machete”, pickaxes and other tools that usually made my hands bleed. Those responsibilities made me value the work of many women around the world that with their strong hands produce food for their family and world. What is the biggest challenge you faced in your life right now and how are you coping? I lost someone important to me. I can’t even express how much of a genuine and incredible guy he was; the sort of person who would light up a room just by his presence. I still think about him, but I accept the fact that he’s gone, and I know he would be proud of the way I’m fighting for my dreams. Now I know I have a guardian angel in the sky that is helping me every moment. I have a wonderful family, and incredible friends, but must important, I have GOD; he has been my strength and my shield. A lot of people think that Ecuador is just that imaginary line that we studied in the school. A tall mountain, a valley surrounded by green trees, beautiful beaches, jungles, or beautiful islands, well, we are all of that and even more. We have different regions, and different types of weather. Ecuador is very diverse, you can drive four hours and go from a warm beach to a snow-covered mountain, drive for another 4 hours and you could probably reach an Amazon rain forest. WATER. Water can make you look beautiful naturally, we need to drink 6 to 8 cups per day, and this tip can be the answer to our biggest beauty problems. I don’t know if I would say “difficult”, because I’ve really enjoyed every step of my preparation. But changing my life routine, spending a lot of time in classes instead of spending time with friends or family, maybe that’s not so easy, but if it is an effort for something you really want, you can do it. There are many good things about social media, and also many bad things. We can have a lot of supporters, or maybe some haters. In the end, my advice for my fellow contestants would be to trust yourself, take a clear-eyed look at your goals, always have self-confidence and keep your life centered in reality; use social media as a way for communication, but not as your complete life. For those who can’t, it might be time to turn off the computer and cellphone for a bit, and go find a mirror, find yourself, who you really are, and what you deserve. I love the image that we have been making in beauty pageants, a woman who is not only beautiful outside, but actually contributes to society, using the pageant as a platform for lead projects. Use our voice. I don’t really have one favorite. I love the way the Miss Universe Organization always choose a different type of amazing girl, because they are all different, or am I the only one that notice that? Different smiles, bodies, personalities; they are showing us that there is not a “perfect model”, or “perfect size”, we can always be confidently beautiful in our own way. You don’t have to be someone else; you have to be the best version of yourself. I have been fighting for breaking stereotypes. Becoming a woman, with a man profession (Agronomist Engineer), showed me not just that I can become a strong woman who can lead an agribusiness company, it showed me that I can become whatever I want. Women in this century have been showing that we can afford any challenge, any barriers. I think I can give Miss Universe a girl that can continue fighting, to show that we can work for our people, our environment and our world in an excellent way, with new ideas and projects, and of course, without stop having our confidently beautiful attitude. I thank you from the bottom of my heart for your support; it means a lot to me every message and every advice. I feel that I’m doing it right, because I have support from people from different parts of the world like the Philippines, Venezuela, and of course, my people from my beautiful country Ecuador that is with me. Thank you all, you will not be disappointed.